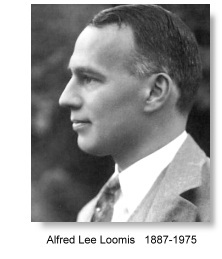 Alfred Lee Loomis was a Wall Street tycoon, a famous scientist, a lawyer and a true legend in the history of the United States. Born of upper-middle-class parents, Loomis was a brilliant mathematics major and inventor at Yale University. After attending Harvard Law School, he joined a prominent Wall Street law firm and in short order became one of its brightest young stars, specializing in complicated corporate financial transactions. During the first World War, he used his undergraduate training in mathematics and science, along with his detailed knowledge of European field artillery---an interest developed in college-to secure the assignments he wanted: first to the old Army proving ground at Sandy Hook, New Jersey, and later to the new Aberdeen Proving Ground in Maryland, which opened for business in January 1918. There, as a lieutenant colonel in charge of development and experimentation, he invented a number of instruments (two of which were later patented) that would be used for the next twenty-five years in measuring external ballistics. After the war, he entered investment banking and made a huge fortune with his brother-in-law Landon Thorne by spearheading the complex financing of the nascent electric utility industry, handling upward financing of over $1.6 billion US dollars at the time. The two also helped to organize many important mergers and acquisitions, and in the process acquiring numerous seats and untold influence on the resulting boards of directors. They were lauded not only for their success, but for their application of scientific principles and long-term economic planning to the management of public resources and provision of cheaper and more reliable service to consumers. Fortune magazine described them, in February 1930, as "the most potent force in shaping the present and future organization of America's huge, complex power and light business." Sensing the oncoming Depression, he cashed out of the market, protecting the assets that would support his extravagant and idiosyncratic lifestyle. Loomis alone earned an estimated $50 million during the early years of the Depression. Throughout the years, while he traded vast sums of money on the financial market during the week, in the evenings and at weekends he worked with the world's greatest scientists at his own secret laboratory in New York. In the early 1920s Loomis and his staff conducted experiments in sound waves, spectrometry and precise time measurements. He was credited with the inventions of the Aberdeen chronometer, a microscope centrifuge, and a pressurized fire extinguisher. The modern ultrasonics era arose from Professor Paul Langevin's 1917 invention of the quartz sandwich transducer for underwater sound transmission in submarine detection. Loomis renewed the wartime acquaintance with Professor Robert Wood and offered to collaborate and underwrite any joint research ventures. In 1926, Wood told Loomis of Langevin's experiments and suggested the subject offered a wide field for research in physics, chemistry, and biology. It was this group that had allegedly introduced ultrasound to chemistry in 1927. When a liquid is exposed to ultrasonic waves bubble growth is created which is known as cavitation. Sound waves stress these bubbles, causing them to grow, contract and eventually to implode. With implosion, immense heat and pressure are produced that speed reactions. Every imploding bubble is a microreactor in itself. This is due to the extreme heat released upon implosion that creates a local hot spot. Temperatures can reach 5000°C with pressures of several hundred atmospheres. These benefits make sonochemistry has in recent times became a useful tool for the synthesis of chemicals, pharmaceuticals and the production of new materials with unusual properties.
" .... radiation pressures of sufficient magnitude to support 150 g and to raise a pronounced mound of oil 5 cm above the transducer; intense searing of the skin by the vibrating glass rod and the burning of wood chips and the etching and drilling of glass pressed against the tips of vibrating glass rods; heating of liquids and solids and the formations of emulsions and fogs; biological effects including rupturing of red blood cells, killing of cellular organisms, and harmful to lethal effects on fish, frogs, and mice; observations of chemical reactions and crystallization and flocculation of particles suspended in a liquid......"
These pioneering results could be taken as a present-day litany of ultrasonic achievements. Wood and Loomis also made observations of the modal patterns of rods, tubes, and plates and gave some of the first experimental data on phase velocity in rods and disks. Another first occurred when they made an ultrasonic horn by drawing down a glass tube to a tapered point to concentrate the energy at the point of application. Publication of these results started avenues of work being exploited to the present day. Wood did not continue work in ultrasonics, but returned to optics and spectroscopy. Aside from a 1939 "supersonics" monograph, in a scientific career spanning a half-century, this was to represent his involvement with ultrasonics. Loomis continued with other collaborators in research on the chemical effects of ultrasound while maintaining his interest in precision time measurement and other scientific areas. The first practical radar system was produced in 1935 by the British physicist Sir Robert Watson-Watt, and by 1939 England had established a chain of radar stations along its south and east coasts to detect aggressors in the air or on the sea. 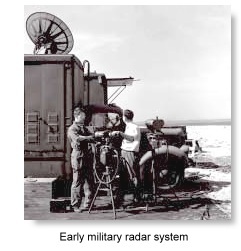 The Chain Home radar network, operating on metric wavelengths, was insufficiently accurate to detect small targets such as individual aircraft. 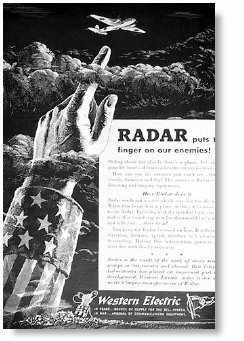 What was needed was a radar system operating on a narrow beam that could either sweep the sky with a fan of radiation or point like a long pencil of light through the dark. Very short wavelengths had to be generated for this purpose but this was no easy task. In September 1940, while the Battle of Britain raged with daily air raids, a device called the cavity magnetron made its way from England to the United States as part of a top-secret mission. The palm-size radio transmitter produced high-frequency waves at tremendously high power levels. It was invented by physicist Henry Boot and biophysicist John Randall at the University of Birmingham, working under Professor Mark Oliphant. As the U.K. scientists knew, the device would enable microwave radar systems to track enemy aircraft and ground targets. Radar already existed, but it was neither compact enough to be mounted on planes nor accurate enough to be effective at night. To get the new technology into the field—and to turn the tide of the war—the United Kingdom needed U.S. industrial strength, as well as electronics expertise from MIT, Bell Labs, and other U.S. research institutions. On the evening of September 29, 1940, a small group of men gathered in the sitting room of the exclusive enclave of Tuxedo Park. Most were American. But two, John Cockcroft and Edward Bowen, were the British physicists who had arrived in the United States as part of the top-secret mission. With some fanfare, they produced a small wooden box, inside of which sat a device called the cavity magnetron, which they promised could generate 1,000 times more power at a wavelength of 10 centimeters than any other microwave transmitter known to U.S. technicians. Apparently the British had better receivers and the United States had better senders, and these were combined. The event proved a milestone in the war. Within six weeks, more than a year before formally entering the conflict, the United States started the famous MIT Radiation Laboratory to develop microwave radar systems based on the magnetron. The nation’s top physicists—10 future Nobel laureates in a lab that employed nearly 4,000 workers by war’s end—accepted the challenge. And they succeeded brilliantly, creating radars for the hunting of U-boats, navigation and bombing, fire control, search and early warning, and air-to-air fighter interception. Ground radars such as the SCR-584 in 1942 immensely threatened the German operations. Many of the scientists including Albert Eintein later went on to work on the atomic bomb, but few afterward doubted which project was more important to the war. Indeed many believed that the radar was the most important thing for winning the war although it was bought to an end by the "bomb". From the late 1920s through the 1930s Loomis and renowned scientists performed good research at Tuxedo Park. Besides working with Wood on ultrasonics; he co-laborated with George Kistiakowski on spectroscopy; and with E. Newton Harvey on electrical signals in the brain and heart. 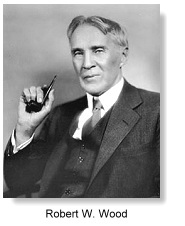 He invented the artillery chronograph to better measure the speed of artillery shells, practically invented the EEG, investigated precision time keeping, and concieved of and patented the LORAN system (Long Range Aid to Navigation) of navigation transmitters, receivers, and high precision clocks. He was instrumental in helping E.O. Lawrence obtain funding to build the big cyclotron at Berkeley, and even maintained an office in Lawrence's Berkeley Lab for a time. Loomis authored and co-authored 29 scientific papers between 1927 and 1939, all with established scientists; the papers were published in leading journals. He also obtained two patents during this period. When projects he worked on led to series of papers, his name usually appeared only on the first. He did not participate in all the projects carried out at the lab. He had also been friends with Vannevar Bush, who in mid-1940 convinced Franklin Roosevelt to start the National Defense Research Committee (NDRC) to coordinate the work of civilian scientists in the event that America was drawn into the European war. Loomis’s own radar studies, coupled with his money and influence (he was a first cousin to Henry Stimson, Secretary of War in both world wars), made him Bush’s ideal choice to head the NDRC’s fledgling microwave radar project. It was in that capacity that Loomis hosted the British scientists who brought the cavity magnetron to Tuxedo Park, and on the heels of their visit he took a leading role in forming the Radiation Laboratory. Read the book that was written about his fascinating life: Tuxedo Park: A Wall Street Tycoon and the Secret Palace of Science That Changed the Course of World War II by Jennet Conant.